Dimensions 486'6" by 63'6" by 25'6"
Barnett received replaced her 5" gun with 2x2 40mm Bofors AA guns in 1943. The McCawleys were Grace liners completed in 1928 in British shipyards and acquired by the U.S. Navy in 1940. Each could carry just 20 small landing craft, which required that the troops be landed in three or four waves. 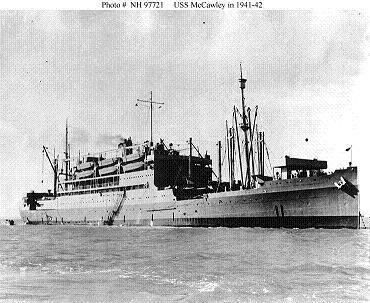 McCawley was selected by Turner as his flagship for the Guadalcanal campaign. This was an unusual move at the time, but prefigured the use of amphibious command ships in landing operations.